Sometimes you may need to phase-lock a numerically controlled oscillator (NCO) to an external clock that is not related to the system clocks of your ASIC or FPGA. This situation is shown in Figure 1. Assuming your system has an analog-to-digital converter (ADC) available, you can sync to the external clock using the scheme shown in Figure 2. This time-domain PLL model is similar to the one presented in Part 1 of this series on digital PLL’s . In that PLL, we dealt with phases only, which resulted in a very simple model. Here, we have a sinusoidal reference signal instead of a phase reference signal, so we need to make some modifications. Our new model adds a Hilbert transformer and a complex digital phase detector (PD). The Hilbert transformer converts the real input to a complex signal. The complex PD compares the phase of this signal to that of the complex sinusoidal output of the NCO. 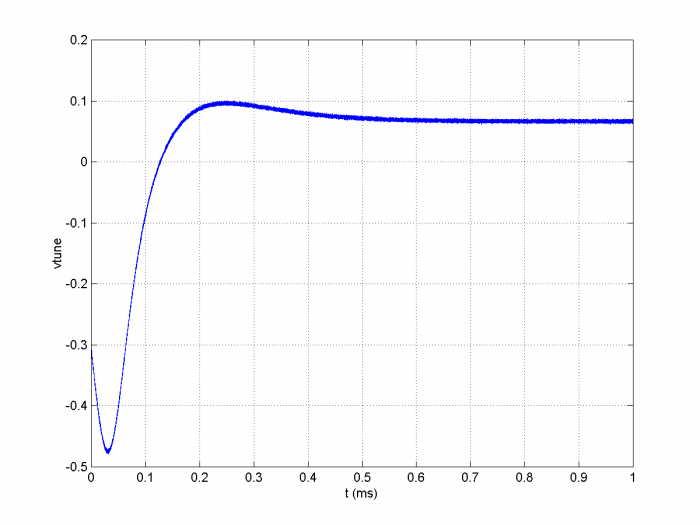 The model includes ADC quantization noise and the Gaussian noise of the ADC and external clock, allowing us to examine how they affect the NCO output phase noise. However, the model does not include the phase noise contributions of the PLL sample clock or the external clock. 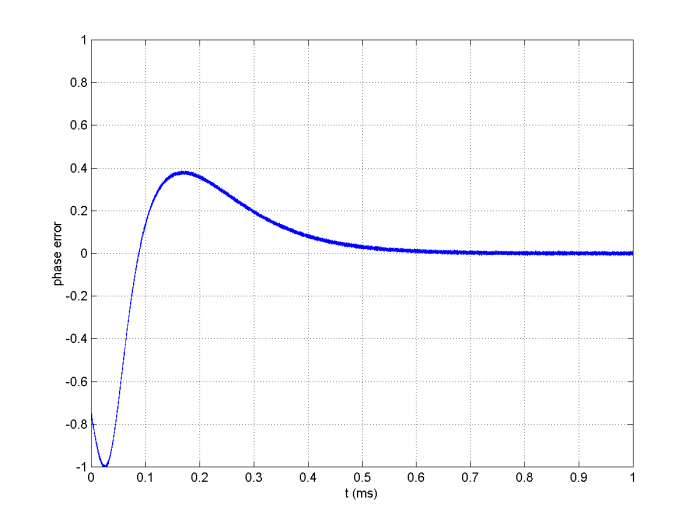 In this post, I’ll describe the components of the PLL and then perform a couple of simulations. A word of caution: I have not implemented this design in hardware, so there may be gotchas with the approach that I have not anticipated. This article is available in PDF format for easy printing. Figure 1. How do you phase-lock the NCO to an external clock that is unrelated to the system clocks? Figure 2. PLL to phase-lock an NCO to an external clock (wide lines are complex signals). Here we’ll use the same 31-tap Hilbert transformer presented in an earlier post . Its Matlab code is part of the m-file listed in the Appendix. For sinusoidal input, the Hilbert Transformer generates I and Q sinusoids, with Q lagging I by π/2. The pure-imaginary frequency response of Q/I is plotted in Figure 3. 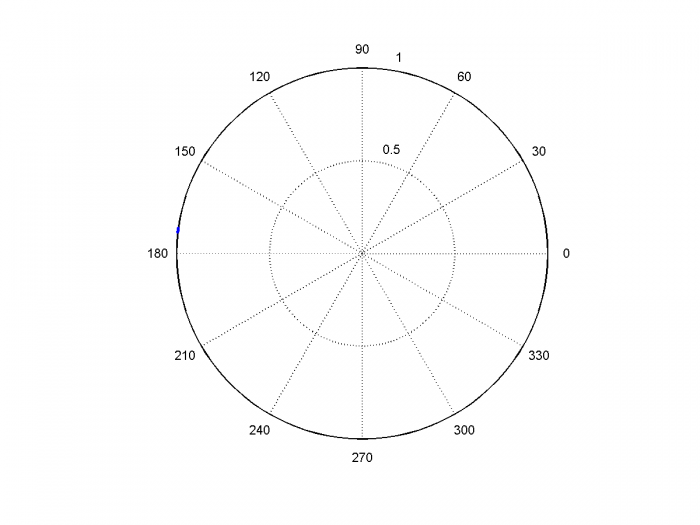 For sample frequency of 40 MHz, this design allows an input frequency range of roughly 4 MHz to 16 MHz (flat region of the response). Figure 3. 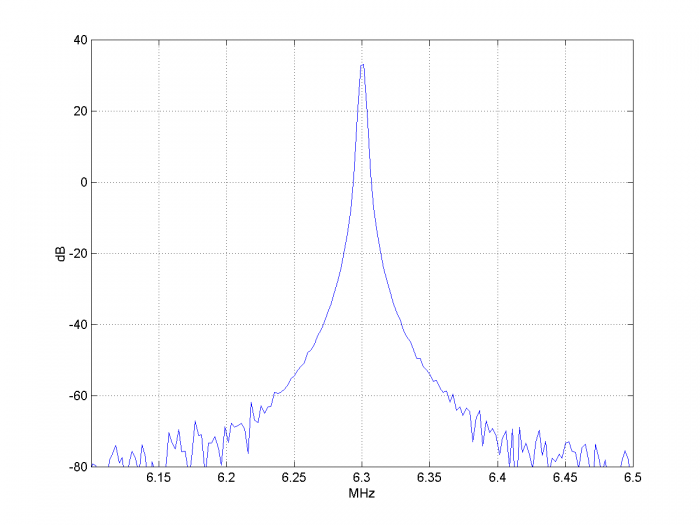 Frequency Response of Hilbert Transformer, fs = 40 MHz. The terms involving ω have canceled, leaving a slowly rotating or stationary phase difference. Equation 1 is plotted in Figure 5 for A = 1. The useful phase error range is from -1/4 to +1/4 cycles or –π/2 to +π/2 radians. The phase detector gain is the slope of the curve near zero, which (since sin(x) ~= x for small x) is -A rad-1. The gain in cycles-1 is thus -2πA. Equation 2 is implemented by the block diagram in Figure 6. As you can see, just two multipliers and an adder are used. Figure 4. Complex Digital Phase Detector Conceptual Diagram (wide lines are complex). Figure 5. Phase Detector Characteristic, sinusoidal input amplitude = 1. Figure 6. Implementation of Complex Digital Phase Detector. In the model, I have assumed the reference clock is a sine with amplitude A = 1. This gives phase detector gain Kp = 2π cycles-1. I used damping factor ζ = 1. For larger values of loop natural frequency, KL may be greater than one, causing the loop filter output level to exceed +/- 1 during acquisition. The loop filter output should clip (not roll-over). Clipping can hurt acquisition, so typically the clip level is set higher than the expected excursion of the loop filter output. It may be appropriate to set clip level to a value greater than +/-1. We quantize the phase to 20 bits and the I/Q outputs to 12 bits. In Part 1, we used the NCO’s phase output as the input to the phase detector; here we use the NCO’s sine and cosine outputs. The model uses the Matlab sin and cos functions and thus does not provide a method of computing those outputs. For a description of a look-up table (LUT) approach for computing sine and cosine, see . For a description of a Cordic approach, see . An anti-alias filter is needed to filter clock harmonics and noise at frequencies above fs/2. The ADC input does not have to be a pure sinusoid; for example, if the third harmonic of the clock is below fs/2, the anti-alias filter does not need to attenuate it. The model assumes an 8-bit ADC using the same sample rate as the NCO, and includes Gaussian noise on the input clock. This noise represents noise of the clock source and the input noise of the ADC. The SNR due to quantization noise of an ideal 8-bit ADC is 6.02*8 + 1.76 dB = 49.9 dB . 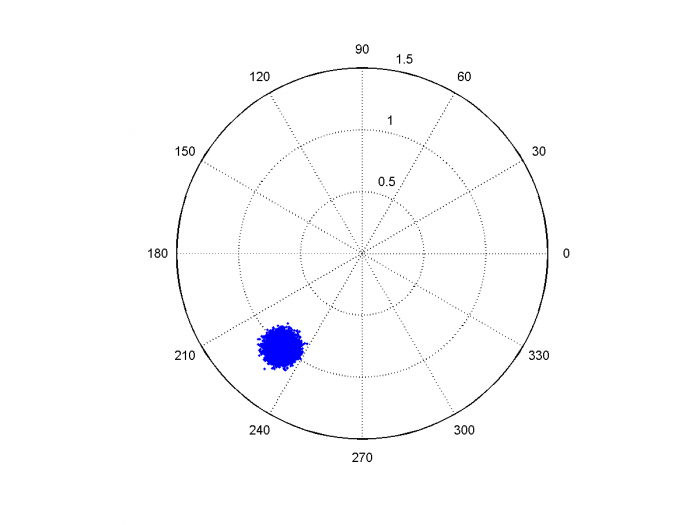 I somewhat arbitrarily chose a Gaussian noise amplitude σ = 0.0015 (See Appendix for Matlab code: .0015*randn(1,N) ). For input clock amplitude = 1 V peak = .707 V rms, this gives an SNR of 20 log10(.707/.0015) = 53.5 dB. Thus the Gaussian noise is 3.6 dB below the quantization noise. The gain of the phase detector is proportional to the reference clock level. The model does not include it, but a programmable gain block (or AGC), as shown in Figure 7, would be useful for setting the reference clock level. The gain might have programmable values of 1, 9/8, 10/8, … etc. For example, given an ADC full-scale input of 2 Vpp, if the clock level at the ADC input were 1.5 Vpp, the programmable gain could be set to 10/8, giving a clock level at the Hilbert transformer input of 1.5/2 * 10/8 = 0.94 with respect to full-scale. Figure 7. PLL Block Diagram showing NCO and Loop Filter parameters. This time-domain simulation solves the difference equations of the 2nd-order PLL, as was done in Part 1. The PLL model in Part 1 did not include quantization. Here, I have quantized a few key signals: the ADC output; the NCO phase and NCO output; also the Hilbert transformer coefficients. The m-file for this simulation is provided in the Appendix. Table 1 lists the parameter values used. Note that the values of KI and KL used result in loop natural frequency of 2 KHz, with damping of 1.0. For a real-world design, we’d probably want to use a lower natural frequency (to minimize spurs and noise from the ADC), but I chose this value to keep simulation time manageable. Note that the loop bandwidth of the PLL is slightly greater than the natural frequency. The external clock frequency is 6.3001 MHz, and the NCO initial frequency is 100 ppm (630.01 Hz) below that. The simulation results are shown in Figures 8 through 12. Figure 8 shows the spectrum of the reference clock at the output of the 8-bit ADC. The highest spur is roughly 75 dB below the carrier level. Figure 9 shows the output of the phase detector as the loop acquires lock. The fuzz on this signal is caused by the Gaussian noise and ADC quantization noise. Figure 10 shows the loop filter output (vtune). Figure 11 shows the spectrum of the NCO cosine output signal. The close-in spectrum of the NCO output is shown in Figure 12. Note that the model does not include the phase noise of the PLL sample clock. 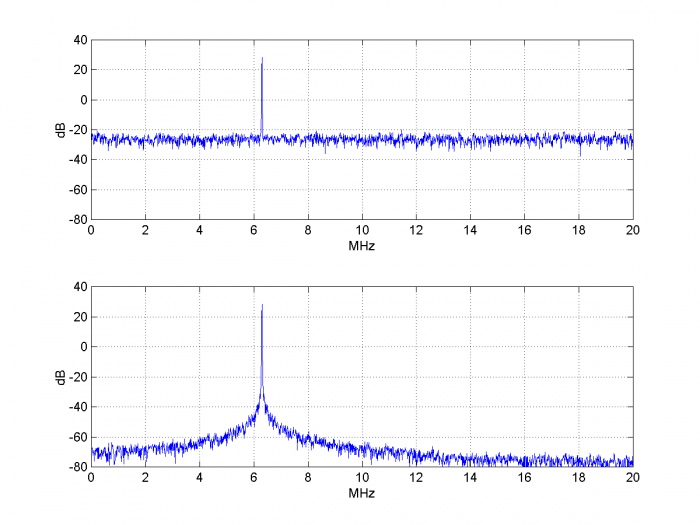 In Figure 11, the highest spur is more than 100 dB below the carrier level – an improvement of more than 25 dB compared to the spurious at the ADC output. This occurs because the spurious level outside the 2 kHz bandwidth of the PLL is attenuated by the PLL’s closed-loop response . But given that the noise is amplitude noise, how does it affect the PLL at all? In the phase domain, you can view the noise as a vector modulating the tip of the clock signal  (See Figure 14 in the next example). The vector has an amplitude and phase component. 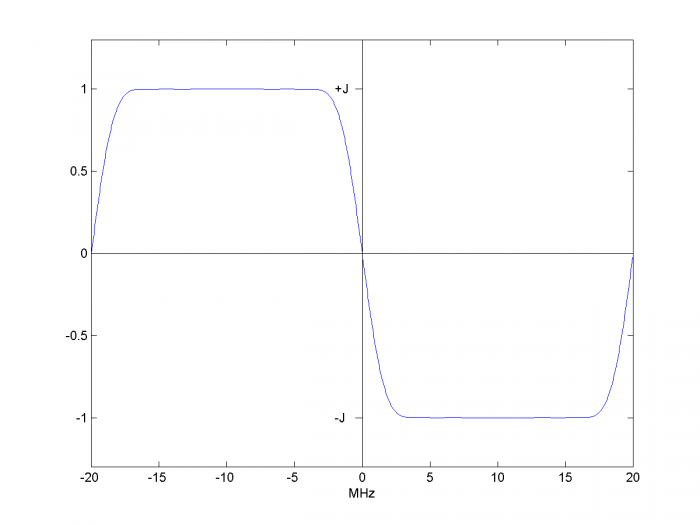 The amplitude component does not affect the PLL. 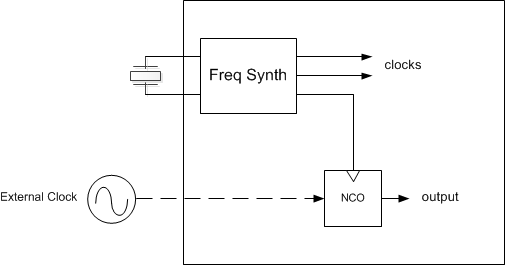 The phase component, if inside the loop bandwidth, appears as noise in the NCO output. If outside the loop bandwidth, it is attenuated by the closed-loop response of the PLL. Keep in mind that in a particular hardware implementation, spurs may fall within the loop bandwidth and thus will not be attenuated by the PLL. The next example looks more closely at the attenuation of noise outside the PLL loop bandwidth. Figure 8. Spectrum at ADC output. Figure 9. Phase Detector Output. Figure 10. Loop Filter Output (vtune). Figure 11. Spectrum of NCO cosine output. Figure 12. Close-in spectrum of NCO cosine output. Span = 400 kHz. The reference clock SNR is 20log10(.707/.05) = 23 dB. It has the spectrum shown in the top of Figure 13. The spectrum of the NCO cosine output is shown in the bottom of Figure 13. You can see the shape of the PLL closed-loop response in the noise floor. Figure 14 is a polar plot of the I/Q output of the Hilbert transformer, derotated to baseband. As discussed in Example 1, you can see that the phase vector is amplitude and phase modulated by the Gaussian noise (the noise causes the amplitude to exceed 1.0, which is a little flakey for a real application, but it works to demonstrate the concept). 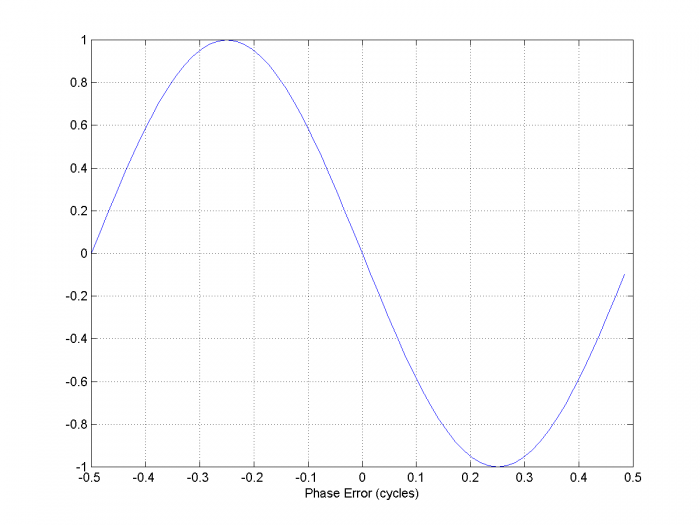 The phase detector computes the error due to the phase modulation, and the PLL attenuates components of the phase modulation outside the loop bandwidth. Figure 15 shows the I/Q output of the NCO, derotated to baseband: you can see that the phase noise is much less than that of the reference clock. Again, the model does not include the phase noise of the PLL sample clock. Figure 16 shows the increased NCO phase noise that results when fn is widened to 200 kHz. Figure 14. De-rotated phase of Hilbert Transformer output, showing Gaussian noise of reference clock. Figure 15. De-rotated phase of NCO output, fn = 20 kHz. Figure 16. 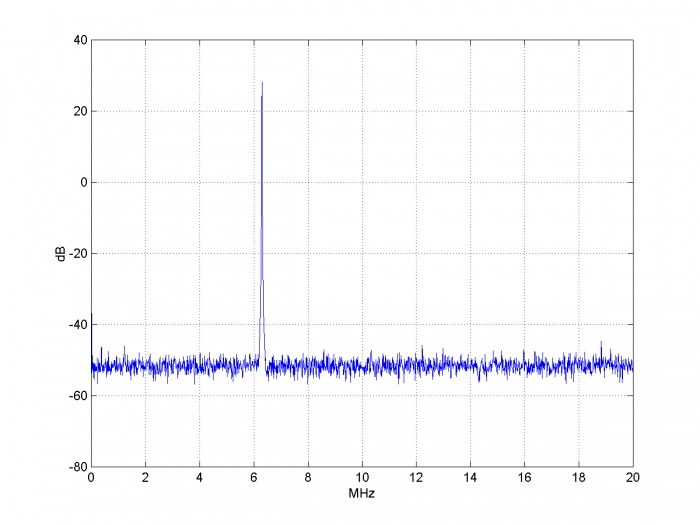 De-rotated phase of NCO output, fn = 200 kHz. 3. Gardner, Floyd M., Phaselock Techniques, 3rd Ed., Wiley-Interscience, 2005, section 13.1.3. 5. Rice, Michael, Digital Communications, a Discrete-Time Approach, Pearson Prentice Hall, 2009, section 9.2.2. 7. Kester, Walt, Ed., The Data Conversion Handbook, Newnes, 2005 Ch 2. Thanks for the article and code. For FPGAs I think you better change the theme from clock lock to frequency lock. By frequency lock I mean automatic carrier tracking for example in QAM receivers. 1) FPGAs (most of them) have analogue based PLL circuitry to generate clocks. Clocks generated otherwise are not recommended. 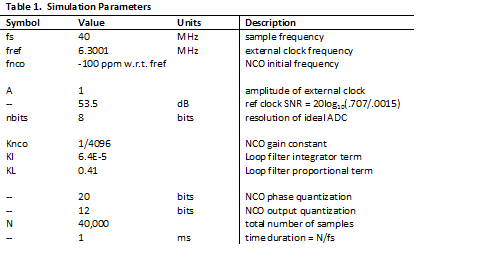 NCO are used in FPGAs extensively to generate sine/cos waveforms rather than clocks for sampling logic. 2) I also believe you don't need ADC for clock input but rather for signal(data) input. I assume the error of phase you are using is based on Costas loop. You are correct that the master clock of an FPGA (or ASIC) is generated by a conventional pll/ frequency synthesizer. This is shown in Figure 1. However, it sometimes happens that you have a system clock that must remain untouched, yet you want to lock to an external clock source. That is the situation I am addressing here. The reference input is a sine wave (or filtered square wave), so this discussion is not about carrier recovery. It is strictly about locking to an external clock. As an example of the application, I once had to test an upstream OFDMA transmitter in an FPGA before the FPGA receiver design was ready. I had a reference clock available from the "head-end" OFDMA receiver. So for initial testing, I locked my FPGA's NCO to the external clock using an approach similar to the one I described here. The ADC is normally required rather than just a gate because capturing a signal with a gate results in an SNR of 6.02*1 + 1.76 = 7.78 dB! Finally, there is no Costas loop involved in this approach. Thanks again. I can summarize your idea as comparing two complex tones and using the filtered error of I1 x Q2 - Q1 x I2 as negative feedback on NCO. Obviously this error tends to zero if both tones align and should work. Clearly you are locking FPGA NCO to external clock (not the other way round). This raised an issue in my head; What if we just don't lock and use clock domain crossing instead. I say that because external clock is unrelated and so its locked version from NCO output will stay unrelated with respect to FPGA system clock. In short I am not clear about the overall clocking of your system and the purpose of clock lock. I have done clock lock on external analogue PLL by deciding charge pump from FPGA using very simple gating. This way I locked DAC clocks to fpga system clock. There are no doubt thousands of reasons for phase-locking to an external clock; maybe someone can suggest others. I gave you one application in my initial reply. Thanks a lot. I was looking for this! Kindly note that the example MATLAB code is distorted in the following line. "b2= [0 0 0 00 0 0 00 0 0 00 0 0 1]; % delay of 15 samples (CT of filter)"
There should be a space after each 0. Also, MATLAB is no longer facilitating 'psd' function in it's newer releases. Thanks for pointing out the error. Do you have an application that requires locking to an external clock? "Do you have an application that requires locking to an external clock?" Yes, I have to determine the instantaneous frequency of the external clock. Another question: How do you select knco? Typically, you "round" df_max such that Knco = 2^-k, where k is an integer. Once Knco is chosen, then KL and KI can be computed to obtain the desired loop bandwidth and damping. Note in my model Vtune sometimes exceeds +/- 1.0 during acquisition. I'm not feeling up to looking at your code now. Keep in mind that the loop bw I used was 2 kHz, so any frequency modulation would need to be less than that, and probably a lot less. Great article Neil. One application for this versus the PLL's readily available in FPGA's is when one wants a phase reference of the input signal since you can read the instantaneous phase directly from the phase accumulator in the NCO. (Assuming you have a reference time to initiate the NCO state). You could of course just use the Hilbert Transform and complex phase detector to get this, but by doing the full lock and reading it off the phase accumulator you get the benefit of an optimized loop filter effectively acting as a tunable bandpass filter on the input signal (so much tighter filtering is achievable versus what you could do by just low pass filtering the phase detector output if there are any risks of small frequency offsets). Regarding other comments of simply using the PLL in an FPGA: The PLL's in FPGA's are great for their purpose of creating digital clock signals where our concern is set-up and hold time, but I have found them to be too much too noisy for precision analog sources. 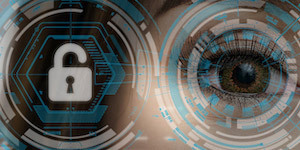 I work in the design of atomic clocks where we are very concerned with short and long term frequency stability and we were unable to use the FPGA PLL's in our critical clock loop path, and do use NCO's and such digital lock loops. Of course the clock to the final DAC used is critical to achieve the desired spectral quality. I would be tempted to proceed without the Hilbert Transform and just use a single multiplier as the phase detector (with a simple low pass to get rid of the 2f signal component in addition to what the loop filter will also reject), the result would lock in quadrature phase of course, but if a quadrature NCO is used either output can be used as the feedback. You may have had other motivations to go with the full complex phase detector, could you comment on that? Thanks for providing these insights. I have not tried modeling a simple multiplier. As you mentioned, it has a 90 degree phase offset. One thing to check would be performance for non-sinusoidal input. Note that the Hilbert transformer I used with the complex PD is not very large: only 16 non-zero taps in this example. So perhaps not a bad price for the performance. I would think that performance with a square wave vs sine wave would be similar if not better- consider how an X-Or gate can be a simple phase detector / multiplier; what occurs in that case is you get a linear error output vs phase rather than the sinusoidal result so many actually be preferred in some cases! Further doing such a hard limit would also eliminate AM contribution so you can follow that thought to a very simple real phase detector could be created with 1 bit multipliers! That would be an interesting performance trade study. Where I think you may benefit with your approach is a 3 dB increase in SNR at that location in the circuit as you are essentially doing a single sideband down-conversion of your reference input --- so to the extend you are noise floor limited there it should give you that (if my thought process is correct). Good article again, looks like you put a lot of work into it, it is very easy to follow and I am sure this will help a lot of people- thanks for sharing! Comparing an XOR gate to other phase detectors: Most phase detectors have zero output when phase error is zero, thus they generate minimal noise when the loop is locked. But an XOR gate output is always toggling between 0 and 1, so there is a lot of energy there that needs to be attenuated by filtering. So I would be careful when using an XOR gate. I believe all that toggling is centered up at the doubled frequency (double the input frequency) similar to analog mixer, so should not be too challenging to attenuate with filtering. 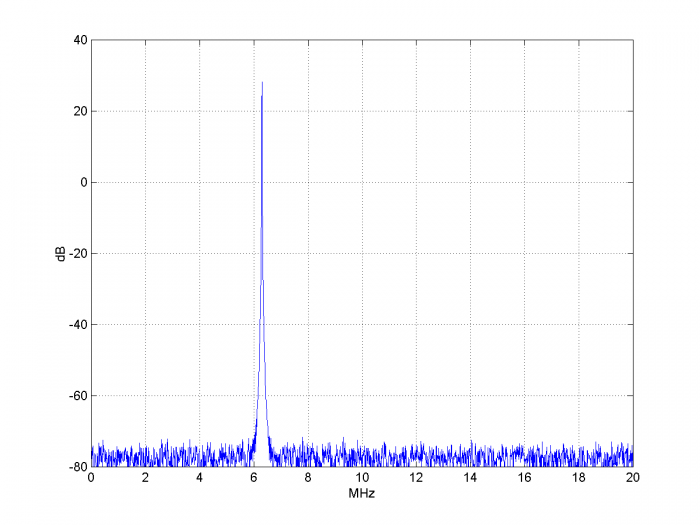 Note that the most common phase detectors used, the Phase Frequency Detector, also does a lot of chattering! Many thanks to your g posts. May I ask that how do you derive the NCO gain? I couldn’t find much on this aspect. Say if I implement a 32bit DDS. Is is correct that my NCO gain is 1/2^32? But why? Knco is just the value of the gain block in front of the NCO accumulator. For example, if the gain block is 1/4096, then NCO gain Knco = 1/4096.